One of Dayton’s best kept secrets is a foodie paradise at the corner of Wayne and Keowee/Adams- tucked behind the “Quality Motors” used car lot. It’s Halal International Grocery, where you can get all kinds of pita for about half of what you’d pay at Kroger, as well as having a choice of three kinds of feta- cut off huge blocks that sit in brine. So, when I noticed the new rotissarie grill the other day, Faez (the owner) told me he was making shwarma now. While most of you may have had a gyro- this is a bit different, starting with the meat. 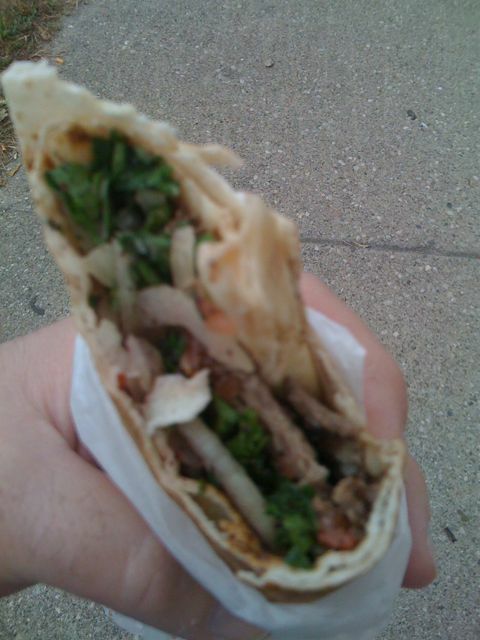 Most Gyro places buy a chunk of frozen pressed meat that can contain lamb, beef or pork- Halal uses fresh cuts of lamb that they stack on the skewer themselves. Instead of the traditional yogurt based tzatziki sauce, he makes a sauce with Tahini and lemon juice. While the sliced tomatoes and onions on the pita are the same, shwarma adds fresh parsley. At $3.49 a sandwich- which looks like a wrap- and is packaged to eat as a “stroller” like you’d get from a street merchant in the Middle East, it’s a great deal. Just make sure to ask for some napkins, and call ahead, because if you get there too early, or too late, you may not get yours. Note: currently not available on Mondays or Tuesdays. Halal International Market doesn’t have a website anymore- but the phone is 937-222-1702. The address is 1007 Wayne Ave, but the entrance is in the back, off of Theobald Court. Tell them David sent you. Next Post: Why Obama is marketer of the year. I can vouch for the “or too late, you may not get yours.” factor. You really need to fix that photo margin setting. It is highly unreadable. Mmmmmmmmmmm………….. sounds great. looks great. tastes great. I’m fine. Maybe you just have a weak stomach.